Welcome to Darkest Before Dawn. We are a new non-profit, based in Chicago and Los Angeles, with one simple yet urgent goal: to provide resources, support, and community for our nightlife, restaurant and music venue industry, who's late hours and isolated commutes leave them susceptible to depression, addiction and suicide. Recent data points to a high rate of chemical dependency and suicide for this demographic in our country, especially in the very industries built to provide excitement, leisure and happiness to everyone else. They are the people heading home in the early morning hours, when businesses are closed, the streets are empty, and it truly is the darkest period of time before the dawn. Thank you to the One Off Hospitality Group for making us their September 2018 charity focus, gaining DB4D a $1900 donation from their amazing group of restaurants. Much thanks to I:Scintilla for naming us as their charity beneficiary for their recent remix contest. They raised almost $900 in the process and we couldn't be more thankful. Finally, a massive and humble round of applause and thanks to the Cold Waves attendees in Chicago, New York and Los Angeles who bid on and supported the DB4D raffles and auctions. We raised just over $6000 from the generous attendees who participated. RIP Anthony Bourdain. You were an inspiration and a treasure, a hero to every service industry worker and a beautiful voice for all. If you'd like more information or are interested in becoming a volunteer, please send us an email at info@db4d.org. In the coming months we will build this site into a peer-supported forum for those in need of a voice, a sounding board, a friend, an advisor or a confidant. All of us either have worked or are working in the service or entertainment-support industries. We know the frustrations, pitfalls and isolation of the job, the scarcity of medical or mental health benefits, and the need for help in those dark moments when you are exhausted, frustrated or alone. We want to celebrate the people who work so hard to make our nightlife possible, and to give them something back in return. We are gearing up for a productive debut year in 2018 and look forward to building our team, raising awareness, and helping those in need. Want to make a donation? Your contribution will help immensely in our efforts. Are you a nightlife, service industry or live music venue employee? Take our anonymous questionnaire to help us better serve you. In the summer of 2012, Chicago lost one of its most loved and respected sound engineers and musicians, Jamie Duffy. His work ethic and ingenuity in the local music scene was a gift to many musicians. His abrupt passing had a profound effect on the electronic and metal music families he meant so much to. The result was the birth of a Chicago-based music festival called Cold Waves, and a call to arms to examine the mental health of our nightlife industry personnel. What we found was a staggering lack of resources and support in this community, an oft-overlooked demographic who's very job is to provide entertainment, leisure, and sustenance to the rest of us. We found a very high-risk group working long, late hours, with little to no access to mental health support, and aimed to make a difference. 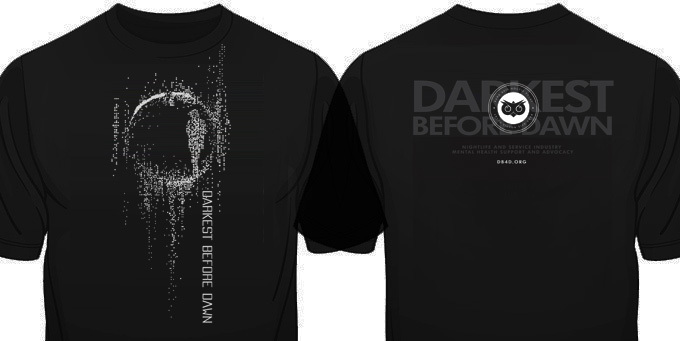 In 2016 we launched Darkest Before Dawn and made it the target of our fundraising efforts from the Cold Waves Festival. 2018 will be our first official year in action, as all fundraising efforts up to this point have been used to launch the foundation and help those in immediate need. We are excited to build an effective team, gain new volunteers and donors, and provide a solid, trustworthy and safe support system for our beloved nightlife industry.